Rosemond believes the process is simple and as straightforward as housebreaking a 4-month-old puppy. Over the past few decades, the age at which toddlers stop needing diapers has been moving upward. In 1957, studies found that 92 percent of children were toilet trained by 18 months. Today, that figure has dropped to less than 25 percent, according to a large-scale Philadelphia study. Only 60 percent of children have achieved mastery of the toilet by 36 months, the study found, and 2 percent remain untrained at 4. Although there are no hard statistics, pediatricians say they are seeing more children with toilet-training problems. The problems include withholding of urine and stool, chronic constipation and wetting and soiling by older children. These developments combined have fed a multibillion dollar diaper industry, which last year racked up $545 million in training pant sales, and spurred the introduction of the giant-sized diaper, designed for toddlers. Three and 4-year-olds still in diapers is not a sight Rosemond is fond of. Rosemond is a family psychologist who advocates a return to traditional child-rearing practices and has decided to do public battle on the issue. In a series of columns, published in more than 100 newspapers last month, he blamed delayed training on poor parenting inspired by Freudian beliefs. 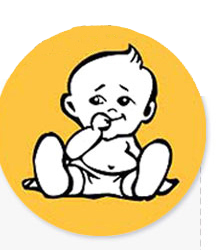 He pointed at Brazelton, professor emeritus of pediatrics at Harvard Medical School, who in the 1960s pioneered the “child-centered” approach, recommending that parents let their children decide when to stop using diapers. This increasing trend for parents to leave the timing of toilet training up to the child, Rosemond said, is largely responsible for the rise in difficulties. And, from the mother’s point of view, her period of service to the child is unnecessarily extended. This prevents her from making the switch from caretaker to authority figure. This sets the stage for numerous discipline problems that the typical mother of 50-plus years ago did not experience with her children. Although Rosemond concedes that Brazelton has been giving the same advice for decades, he criticized the pediatrician for serving as a consultant to Pampers, a division of Procter & Gamble, and for appearing in Pampers commercials. The Wet Set Gazette would like to point out that perhaps the parents should not be completely blamed, or made to feel guilty for their child’s toilet-training issues. However, Toddlers cannot help it if they do not know when they are wetting themselves. We suggest cloth diapers, which in studies have proven to toilet-train babies up to a year quicker than disposables. Why? The cloth diapers let the child know when he/she is wet, as opposed to the disposables, which extract the wetness away from the skin. It isn’t difficult to see that if your child never felt the wetness, and the disposables were taking care of it, why bother learning? Realistically, the child doesn’t have to learn, if it’s always being taken care of. This could last a year longer than what you had planned on, which adds onto the cost of diapers and the amount of lengthened time in which you will be diapering your child anyway. It may seem as if disposables are the quickest, easiest way to diaper your child, but the long-term effects especially in the area of toilet training could be detrimental to the esteem and health of your child.